This Gingerbread Cake (doctored cake mix) recipe is moist, so flavorful, and so EASY to make! In the photo above, we added a few fun little gingerbread men toppers! They give our cake a little added height and cuteness. I used a few Pepperidge Farm Ginger Men cookies to make them. Simply flip them over, pipe a little melted candy melts or chocolate on the back, place a lollipop stick into the chocolate, and pipe a bit more chocolate on top, and chill for 5-10 minutes in the freezer until firm. 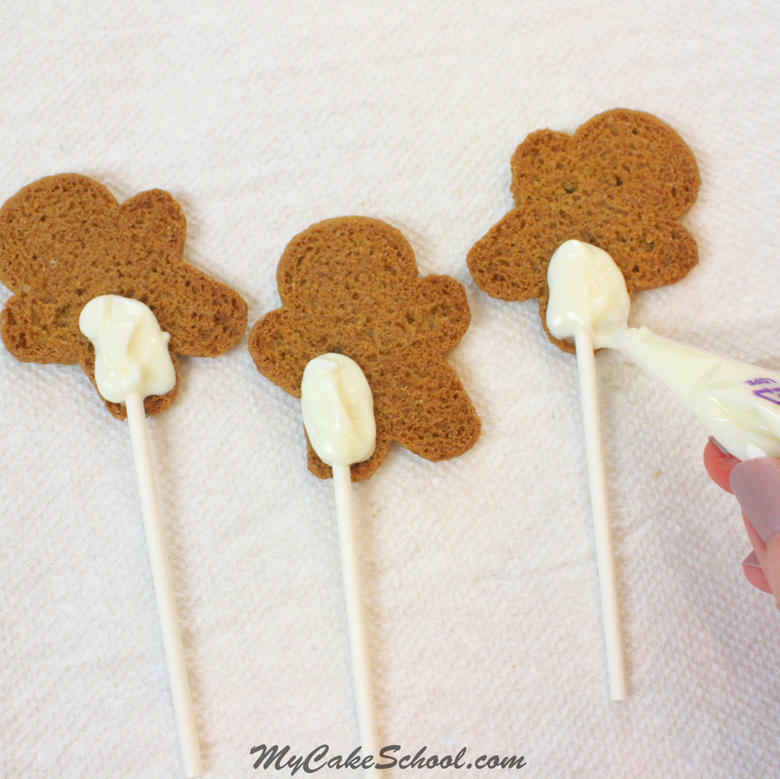 I angled my gingerbread men at various angles when gluing on the anchors so that they almost look like they’re dancing! I just love simple decorations! You can see below that white candy melts probably wasn’t the best choice for a subtle “glue” against the dark gingerbread…maybe I’ll use plain (brown) chocolate candy melts next time! Ha! I outlined them in buttercream for added cuteness but you can see that I kept things very simple! Anyway, they make me smile. When you’re ready to place them into the cake, the lollipop sticks make great great anchors. Ta da! Now this is a happy cake! For our gingerbread layer cake pictured above, we made two thick 8 inch cake layers, which we torted into four layers. It would have worked great as a two layer cake also, but we wanted a bit more filling! 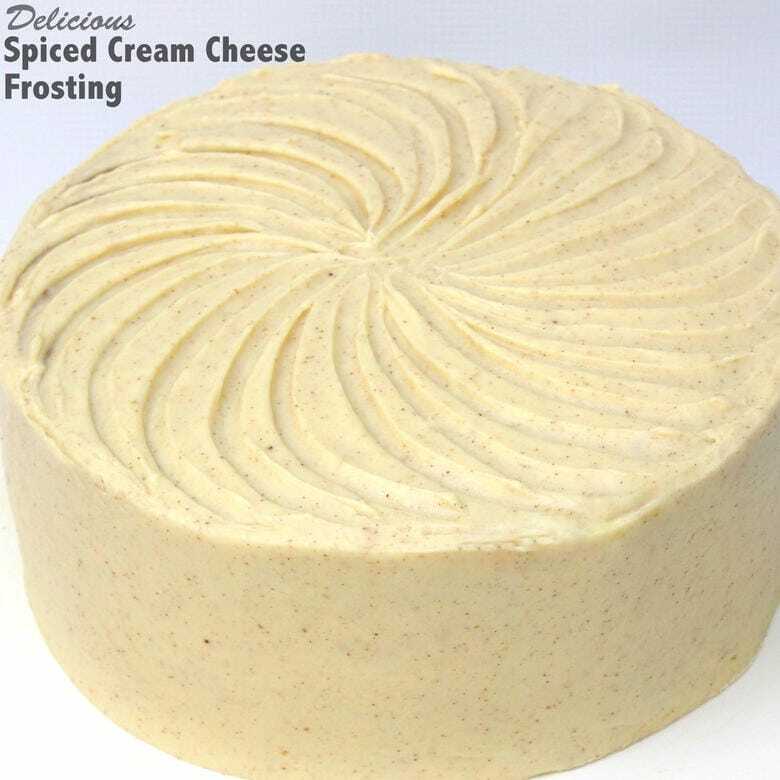 Our FAVORITE frosting for gingerbread cakes and all things spiced is our Spiced Cream Cheese Frosting! So simple to whip up in minutes and the flavor is fantastic! Not only is this a delicious recipe, but it is sturdy enough for fondant as well as light carving. 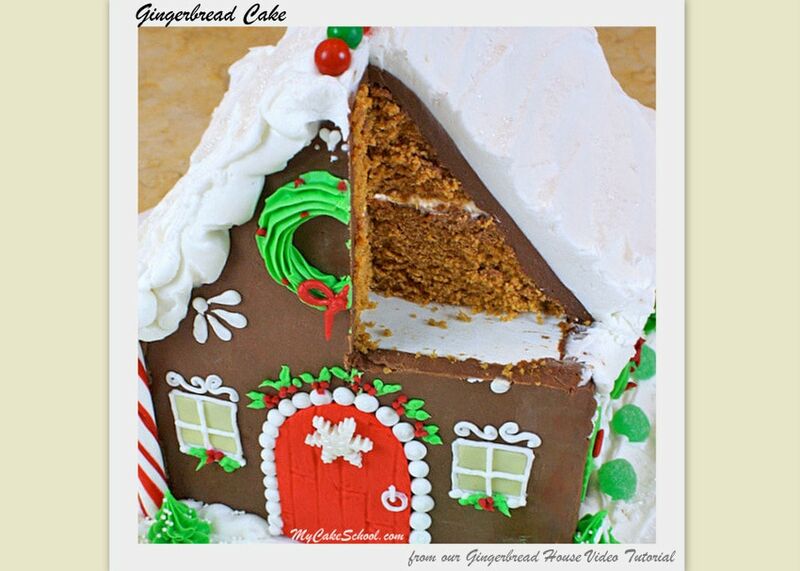 This was the recipe that we used for our Gingerbread House Cake Video Tutorial in our member cake video section. Finally, if you are looking for a fabulous scratch Gingerbread Layer Cake Recipe, we have a great one!! 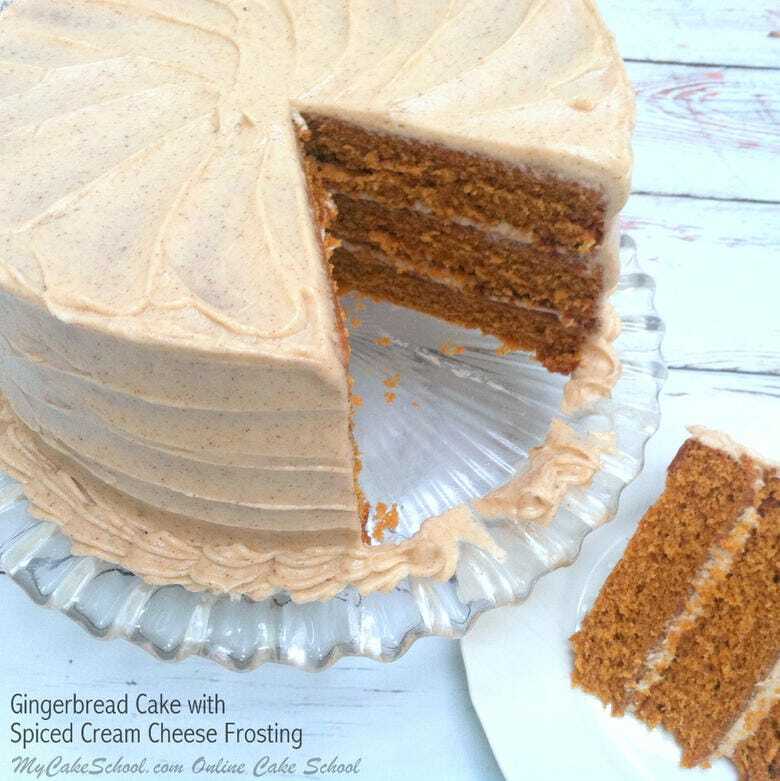 You can find it here: Scratch Gingerbread Cake Recipe. We love them both! Looking for even more Doctored Cake Mix recipes for the holidays? 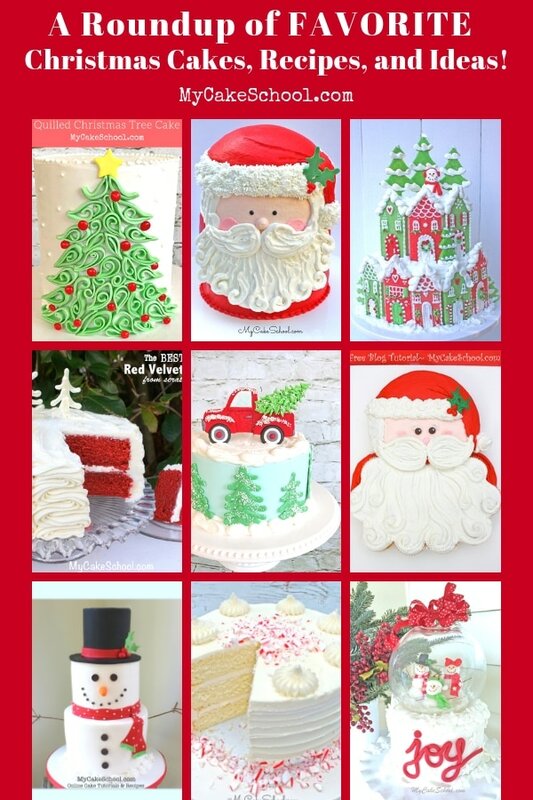 Don’t miss our Doctored Red Velvet Cake recipe or our Doctored Eggnog Cake Recipe! These easy and DELICIOUS recipes are sure to please any crowd! For a full roundup of our FAVORITE Christmas and winter cakes, don’t miss our Roundup of Christmas Cake Recipes, Tutorials, and Ideas! Thanks for stopping by! 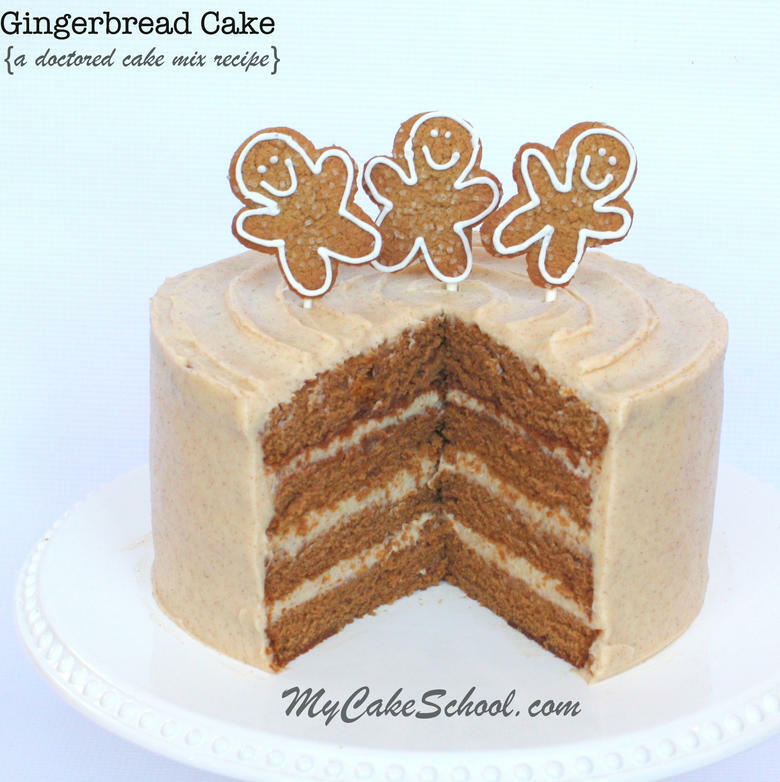 We hope that you enjoy this delicious Gingerbread Doctored Cake Mix Recipe! Do not follow ingredients on the back of the cake mix box, use the ingredients listed below. In the bowl of your mixer combine the dry ingredients and whisk 30 seconds to throughly combine. To this add the remaining ingredients and mix on medium speed for 1 minute ( a bit longer if using a hand held mixer). Scrape the sides and bottom of the bowl and mix 1 minute more. Makes approximately 7 cups of batter. Pour into prepared pans and bake at 325 degrees. Check at 35 minutes, the cake will be slightly pulled away from the sides of the pan and a toothpick inserted in the center should pull out clean or with only a few crumbs. 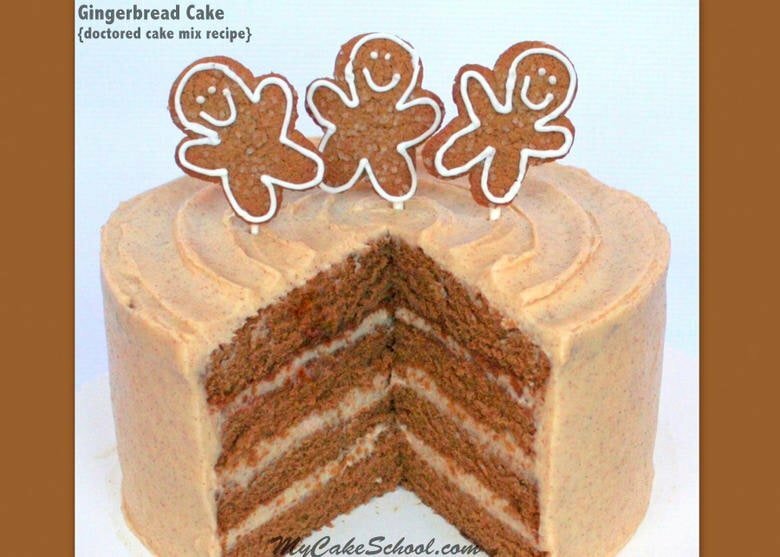 This gingerbread cake recipe is delicious, and works great with the carving necessary for our Gingerbread House Cake Video Tutorial in our member library. I hope that you enjoy it! Hi Melissa/ Bebe do i need to double this mixture to make the house and the roof or will this amount of batter be fine split between 4 square 6″ tins? Will black treacle work instead of Molassis? Hi Victoria, I am not familial with black treacle, but I researched it and see that it shares many of the properties of molasses but is a bit less sweet. Without knowing for sure, I think it should work in this recipe. For your other question, we made this recipe in four 6 inch square pans to make the gingerbread house cake. Hi Bebe, thank you for your help I’m going to give it a go ? Great! Hope all goes well! One of my layers cracked through the middle when I handled it, any suggestions in rescuing again or should I start again? Hi Victoria- I’m sorry that your layer cracked! It should still be fine as the bottom layer. The frosting should hold things together . I would put the cracked side down. Good luck! Hi Melissa thank you for your advice I will see if it holds ? Oh, Waw …Amazing creation! Its look so beautiful..Thank for Recipe! Have been looking for gingerbread cake mix or good recipe since I purchased mini gingerbread men cake pans. I was happy to find yours and look forward to using it for my holiday open house when I bake many varieties of cookies and cakes for friends. Hi Janet, We are happy you are going to use the recipe. Have a wonderful party! Going to try this using gluten free spice cake mix and in a Bundt cake pan. Hope it works since cake mix was so expensive. Hi Marg, Hope all goes well, let us know how it turns out. Hi Bebe, can I make gingerbread men cookies with this recipe? In looking a the recipe and almost having it all done I realized something HUGE was missing. Where is the oil in this recipe? Hi Diana- there’s no oil in this recipe– it’s much like our white almond sour cream cake (doctored cake mix) recipe. If you’d like to add a little oil to the recipe, it should be fine to do so. Hi..I noticed there is no oil or butter in the recipe. Was it omitted? How does the cake stay moist esp with the added flour?? Hi Deborah, No, there is no butter or oil added to the recipe. You can add 2 Tablespoons of oil if you like. The recipe is a variation of our White Almond Sour Cream doctored recipe. Hope you enjoy the cake. Hi Mary, all of these details are listed in the directions above.